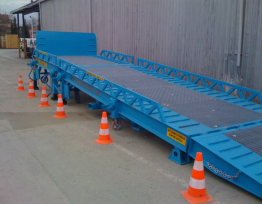 Our Mobile Ramps are designed to provide forklift access from the ground to the truck/trailer and do not require special preparation to launch. Mobile Ramps differ on the following parameters. With support on the vehicle which completely follows truck height during loading and unloading operations. All mobile ramps work on a similar principle. 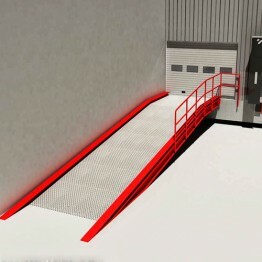 The ramp is raised by a mechanical or hydraulic operator, equipped with a safety system, and is easily moved by a forklift to the required loading/unloading area. 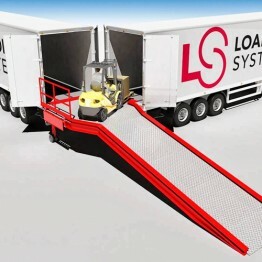 The mobile ramp with support on truck is installed on the vehicle body while the mobile ramp with its own support is installed on the support. After operation is complete, the ramp is raised and is transported back to the storage area using a forklift.